October 25: Running Errands – After leaving the office late, I figured the best way to get to race packet pick up was to run there! The race was a point-to-point course starting in Geyserville and ending in downtown Healdsburg. My friends and I took the shuttle bus to the start, along with most of the other 2,000 participants. The number of costumes was incredible – waldos, schoolgirls, sharks, 50 Shades of Grape, Richard Simmons, zombies, and more. The first mile was all about sorting through the mess of people to find my space and pace. Just after mile 1, the course turned on Canyon road and we faced a long hill. I clearly was not very prepared for this race, so I was surprised not only by this hill, but also all the subsequent rolling hills along Dry Creek road. It’s always amazing what you never notice in a car, that you feel on your bike or on your feet. I’ve been up and down Dry Creek road wine tasting and cycling, and never noticed those little rollers. 13.1 miles and 2 hours and 2 minutes later, I finished the run. I felt good the whole way – I didn’t feel like I was racing, but rather I was out for a long training run. A man dressed as a lobster did beat me. I finished 85th out of 296 women in my age group. I’m happy with my results, given the lack of training. I do feel like I left something on the table though. I am curious as I map out my 2013 Ironman training plan about what I can do to improve my race mentality. How can I learn to push myself harder? What will it take for me to become more competitive in a race? I had one glimpse of that competitive spirit at the Folsom Tri...how can I find more of that drive in 2013 and significantly improve my IMLP performance? 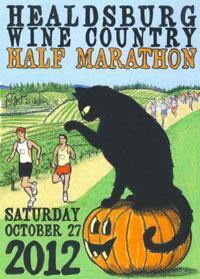 Categories: Races, training | Tags: marathons, running | Permalink. What hurts more – a marathon or an Ironman? You might think, “An Ironman, of course!” But, the consensus around the table after the Boston Marathon was Marathon! I thought I was crazy when I felt this way after my Phoenix marathon earlier this year. But, hearing my buddies from the DC Tri Club (Phil, Kip and Sean) all say they felt worse after the marathon makes me think there is something to this…especially, since these guys are rockstars when it comes to running! Why would running a marathon leave your legs (and your whole body, really) in more pain than an Ironman? How could 26.2 miles hurt more than 140.6? Theories welcome! Categories: FamilyFriendsFans, Races | Tags: marathons, running | Permalink.